The UST Growling Tigers are regaining their composure as they overcame the late game surge of the Lyceum University Pirates in the 2011 FilOil Basketball action. The Tigers won the game with the score of 65-55. The Tigers stopped a 2 game losing skid. They are now in the third place in Group A with 3 wins and 2 losses, behind San Sebastian and Ateneo. This game was very close right from the get go. UST only had a 3 point lead in the start of the 4th quarter. Thankfully, they suddenly got hot from the field and so they were able to increase their lead to 10 points. In the last 2 minutes of the ball game, the Tigers made an 11 to 2 run to finally seal the win for the España based squad. The new go-to-guy of UST, Kevin Ferrer, is looking to replace the UST legend, Dylan Ababou. 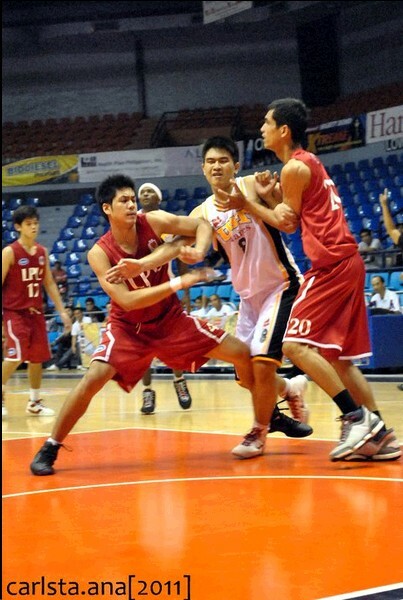 Ferrer was a former UAAP juniors MVP last year. He has an all around style of playing. He had 17 points, 4 assists and 6 rebounds. His partner, Jeric Teng was ejected in the third quarter because of 2 flagrant fouls. The Tigers are slowly making some noise. Just few more wins and for sure they will be considered as once again a top team in the upcoming UAAP 74. They have already have a better record in FilOil than La Salle. Primarily because they seemed to have better recruits this year. They have their new center Karim Abdul who's creating a lot of match-up problems and he is getting plenty of rebounds for UST. Paolo Pe, the former Ateneo Blue Eaglet is also coming out of his shell. He's slowly becoming an aggressive player like Kevin Love. Coach Pido is pushing is constantly pushing him to be the best every time he steps on the court.